The Ulster Unionist Leader David Trimble has agreed to hold one on one talks with DUP leader Ian Paisley about the future of the political process in Northern Ireland. The DUP say they want any meeting between the two parties to involve their negotiating teams, not just the party leaders. The party overtook the Ulster Unionists to become the biggest party in Northern Ireland following last November's assembly election. The two parties have been exchanging correspondence about the terms for a meeting for several weeks. It is understood the DUP want to concentrate on the precise terms of last October's failed Hillsborough deal, whilst the UUP wish to look forward to future options in the process. The Good Friday Agreement review has been overshadowed by concerns over the issue of continuing paramilitary activity, with the Ulster Unionist Party having continued its boycott of the talks. The latest crisis in the political process was triggered by the alleged false imprisonment of dissident republican Bobby Tohill in February. Within hours of the incident, Chief Constable Hugh Orde said the IRA was behind it. 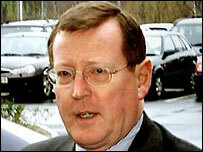 It led to Mr Trimble withdrawing the UUP from the review over Sinn Fein's continuing participation in the talks. 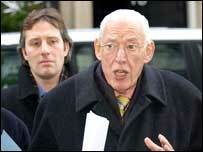 Devolution was suspended in the province in October 2002 amid allegations of IRA intelligence gathering at the Northern Ireland Office.